The damp, gray, April weather of the Pacific Northwest settles over gardens of carnival-colored, fragrant beauties. But the flowers don't seem to care about the passing storm systems. Programmed to send up buttery-yellow crowds of buds, daffodils actively bloom their way through the heaviest downpours with so much enthusiasm you'd think they were doing it to spite the rain. Same with those bold pink camellias, showy parrot tulips, hyacinth ladies of a particular attitude and fragrance. All of them bravely (if not brazenly!) being who they are. No one complaining, or trying to shrink from the surge of life instructing them to bloom, bloom, bloom. In recent days, I've watched out the glass door near my desk as one solitary tangerine tulip grows from a dirt pathway that runs across the bank in our backyard. Defying us to remove her, or walk on her, she glows in place without an iota of self-consciousness. We don't know where she came from - we didn't plant her there... but there she is. You can't ignore her. So I've been letting her speak her piece or, rather, teach by example. She reminds me about my own glow; a glow that sometimes feels dimmed by the slowly retreating siege of winter. I'm reminded to follow the instructions of the life pulse that surges in me... in all of us... to express the love, the beauty, the boldness coded into us by nature. My sudden muse, Ms. Tangerine Tulip, would tell me to allow my true nature to shine, regardless of weather, wind, or a grey mist threatening my mood. She might also have something to say about blooming where you land, where you find yourself; thrive in the conditions you have available. Finally, in the kindest and brightest of ways, she might remind me that by nature, our hearts are happy, our spirits are light-filled, our deep programming is coded for love. ***I have to give credit to my friend, Tonia McConnell, whose blog, Writing Photography Studio, was my writing prompt for today. You will love her flower photography and captions! 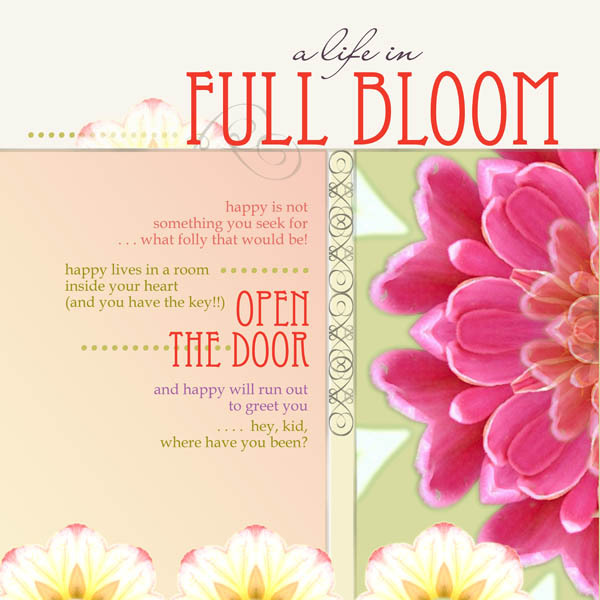 Above image is the full illustration of A Life in Full Bloom that I previewed in an earlier post.